An OpenSSL security advisory issued earlier today on Thursday 2015-06-11 . According to the advisory users should upgrade OpenSSL to fix vulnerabliities that could be exploited by a Logjam attack . The issue affects all current OpenSSL versions: 1.0.2, 1.0.1, 1.0.0 and 0.9.8. Of note, support for OpenSSL versions 1.0.0 and 0.9.8 will cease at the end of the year on 2015-12-31. No security updates for 1.0.0 and 0.9.8 will be provided after that. Users are advised to upgrade to the latest versions of 1.0.1 or 1.0.2. Since Monday 2015-05-25 (a bit more than 2 weeks ago), we've seen a significant amount of CryptoWall 3.0 ransomware from malicious spam (malspam) and the Angler exploit kit (EK). A malspam campaign pushing CryptoWall 3.0 started as early as Monday 2015-05-25, but it has increased significantly since Monday 2015-06-08. The CryptoWall 3.0 push from Angler EK appears to have started around the same time. Both campaigns (malspam and Angler EK) were active as recently as Wednesday 2015-06-10. The timing of these campaigns indicates they might be related and possibly initiated by the same actor. Shown above: Path 1 shows the infection chain from the malspam - Path 2 shows the infection chain from Angler EK. 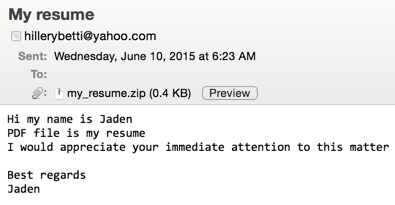 This campaign has been using Yahoo email addresses to send the malspam. 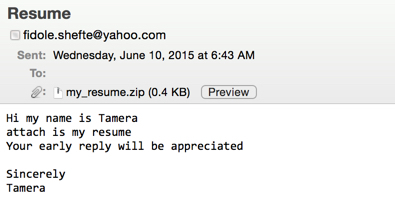 So far, all the attachments have been named my_resume.zip. 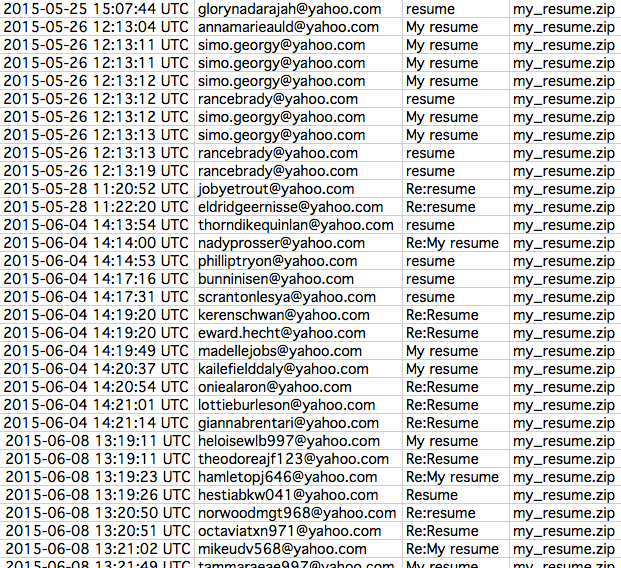 The first week of this campaign, material extracted from the zip attachments were all HTML files named my_resume.svg. 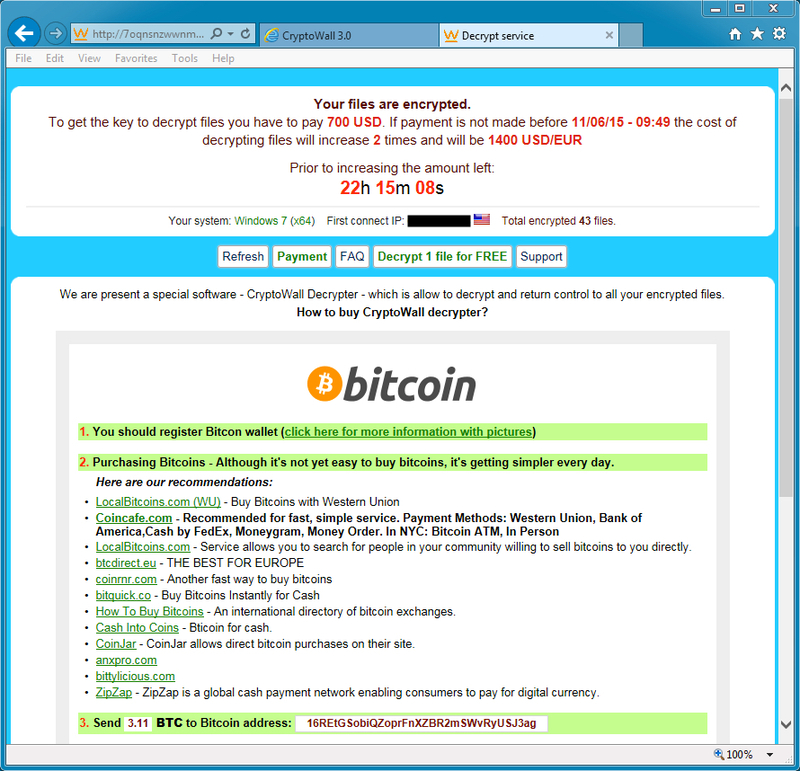 At that time, the CryptoWall 3.0 ransomware was downloaded from a compromised server. 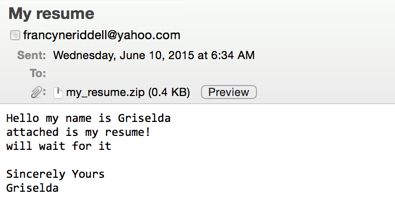 This week, the extracted HTML file names use random numbers, with names like resume4210.html or resume9647.html. Furthermore, the CryptoWall is now hosted on various docs.google.com URLs. 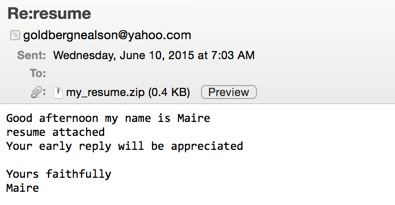 Shown above: some of the emails seen starting on 2015-05-25 through 2015-06-08. Shown above: examples of the malicious spam. Shown above: an example of the HTML file inside the zip attachments from the malspam. Shown above: Traffic from an HTTP GET request to one of the compromised servers. Shown above: HTML returned after the GET request pointing to docs.google.com. Shown above: Wireshark display one of the GET requests to a compromised server. Run the downloaded malware on a Windows host, and you'll find traffic that's typical for CryptoWall 3.0. Shown above: Wireshark display on some of the CrytpoWall 3.0 traffic. The bitcoin address for ransom payment by this malware sample is 16REtGSobiQZoprFnXZBR2mSWvRyUSJ3ag. It's the same bitcoin address from a previous sample found on Thursday 2015-06-04, when we were first notified of this particular malspam . We also saw the same bitcoin address used on Tuesday 2015-06-09  associated with another wave of malspam the following week. Shown above: Decrypt instructions from the CryptoWall 3.0 sample. We first noticed Angler EK pushing CryptoWall 3.0 on Tuesday 2015-05-26 . I posted a diary about it on Thursday 2015-05-28 . This was the first time I'd seen version 3.0 of CryptoWall sent by Angler. I seen previous versions of CryptoWall from Angler, but not 3.0 until this campaign. My last documented instance of Angler EK sending CryptoWall 3.0 happened on Tuesday 2015-06-09 . We're still seeing examples where CryptoWall 3.0 came from Angler as recently as Wednesday, 2015-06-10. In each case I've documented, the bitcoin address for the ransom payment was 16Z6sidfLrfNoxJNu4qM5zhRttJEUD3XoB. Angler EK is still being used by other groups to send different malware payloads. However, the appearance of CryptoWall 3.0 in Angler since 2015-06-26 using the same bitcoin address indicates this is a separate campaign by a specific actor. Shown above: Malicious code injected into a page from a compromised web server (points to Angler EK). A fellow security professional notified me this is a common injection technique used on WordPress sites that have been redirecting traffic to Angler EK. Shown above: Wireshark display on Angler EK and the post-infection traffic by CryptoWall 3.0. The timing of these two campaigns, along with their consistent use of the same bitcoin addresses for the ransom payment, suggest they are related. They may have been initiated by the same actor. This is a significant trend in our current threat landscape. We will continue to monitor this activity and report any significant changes in the situation. I generated more Angler EK traffic on 2015-06-11 at 00:09 UTC. This time, I got a sample using a different bitcoin address than I'd seen from previous Angler-based CryptoWall 3.0 payloads. This bitcoin address, 12LE1yNak3ZuNTLa95KYR2CQSKb6rZnELb, began transactions during the same timeframe as other samples associated with this campaign. At this point, I'm not 100 percent certain it's the same actor behind all this CryptoWall 3.0 we've been seeing lately. However, my gut feeling tells me this activity is all related to the same actor or group. The timing is too much of a coincidence.